If you visit any Quora discussion by clicking links shared on any social networking site, then you’ll notice that Quora locks content by blurring it. You can only be able to see first answer without blocking or without blurring the content. To view all other answers you need to sign in or Sign up to their site by using your Google or Facebook account. This is really one of the annoying thing which is getting popular these days on Internet. To view something on webpage, you need to take some action to unlock that content. This action may include-sign in, sign up, sharing on social networking site or any other such tasks. Quora also comes to the same website list. Not all users are ready to sign up to all the sites that they have visited. The reason might be different for different people. For example, The user may don’t have an account with Google or Facebook or he is using public PC, and he don’t wish login to their account on it. That time you’ll need to unlock content without taking any action. Quora is one of the popular website these days, and many visitors visits that websites on a daily basis. I’m sure at least few thousands of people will face such problem daily. If you are one of them, then here is a solution for it. 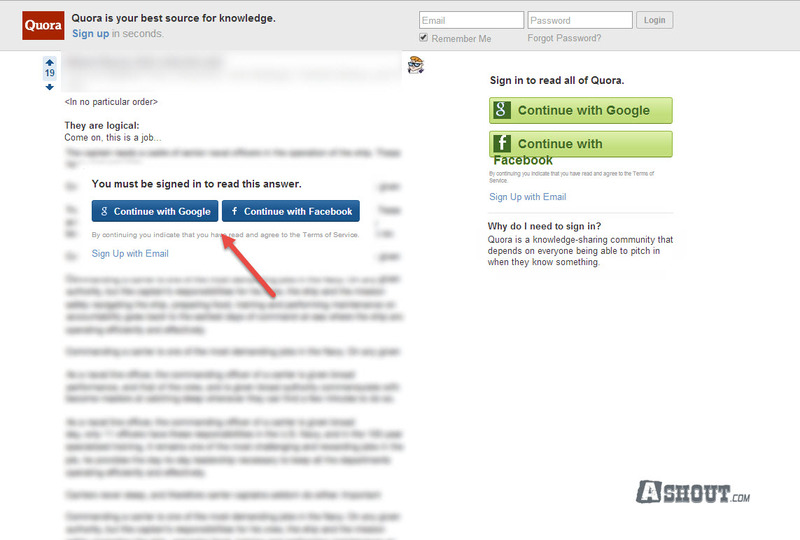 If you visit Quora for the first time, then you’ll notice a login or sign up pop up box. But you can remove this by tapping outside this pop up box or by click on the Close & Read First Answer link which appears at the bottom of the alert box. Most of the visitors don’t even notice that small text. 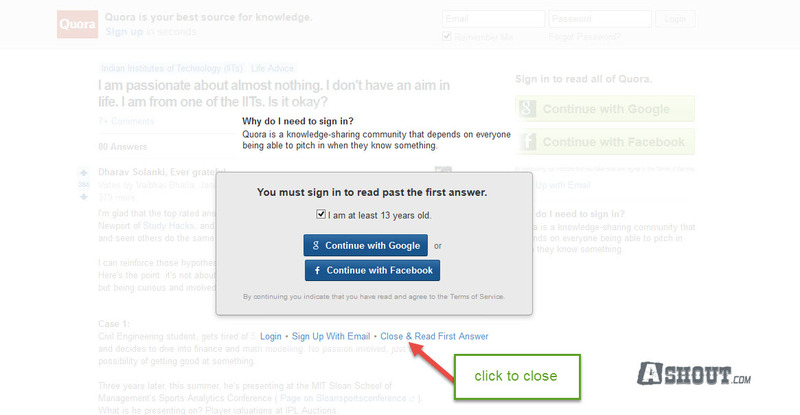 Once you skip login or sign up step on Quora, you are allowed to read only first answer. And all other answers are blurred out so that you cannot read those content unless you log in to Quora account. Quora officially gives users to unblur all the content without doing any sign up or sign in process. All you need to do is, you just need to add small text to the URL address that you need to unblur the content. For example: If you wish to read all the answers on http://www.quora.com/I-am-passionate-about-almost-nothing-I-dont-have-an-aim-in-life-I-am-from-one-of-the-IITs-Is-it-okay this link, then add “?share=1” at the end of the URL address to unblur the blurred content. The above step is a manual process. If you visit quora again and again, then there is a Google chrome extension to do this task. Just install Quora unblocker to add “?Share=1” to Quora URL or to unblock blocked content on Quora. What this extension will do is, it just unblocks/unblur all the content on the Quora website without signing into any account. Thank you so much for this neat ‘?share=1’ param trick! I have created a small GreaseMonkey script for Firefox which exploits it to remove the annoying login popup.